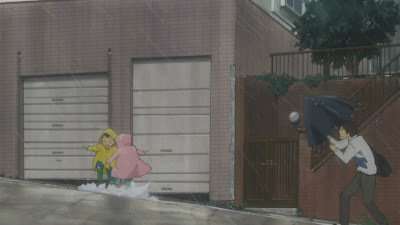 This episode of Usagi Drop was about togetherness, featuring a typhoon. 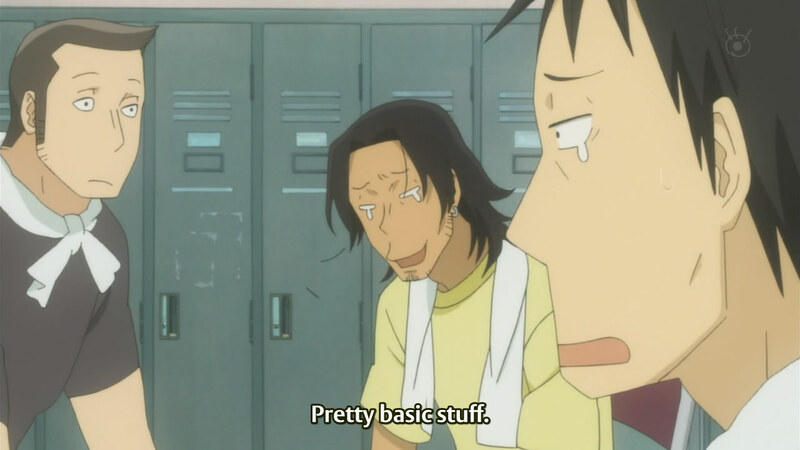 The first half of the episode was focused on Rin and Kouki working hard at school, while Daikichi spoke to his colleagues about the various costs of raising children. The second half featured a shared dinner between Daikichi/Rin and the Nitani household. 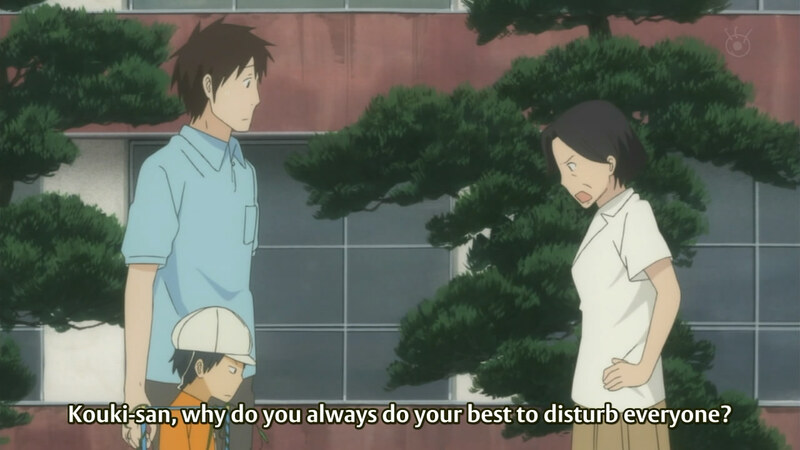 After seeing how well they get along, I'm really rooting for the coupling of Daikichi and Kouki's mother a lot more. Children are so susceptible to suggestion. 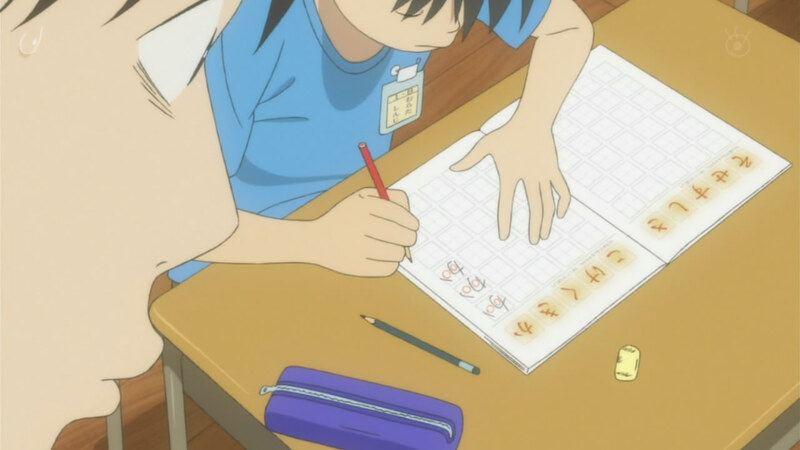 The episode began with the typhoon warning playing on TV and, after the OP, quickly shifted to Rin and Kouki at school - specifically, Rin in her class (Kouki being in another class, apparently). I was surprised to see that they were learning how to write in the first grade (I assume that's what they're in); that seemed kind of late. I thought that the Asian curriculum was faster and stricter than North American standards, so I figured that they would learn things like numbers and hiragana in kindergarten. I worry about the psychological ramifications. The next scene with Rin and Kouki was when all of the first years headed to the yard to draw their individual plants (morning glories). This scene not only highlighted the differences between boys and girls growing up (another minor theme of the episode), but also introduced the differences between the two teachers shown. 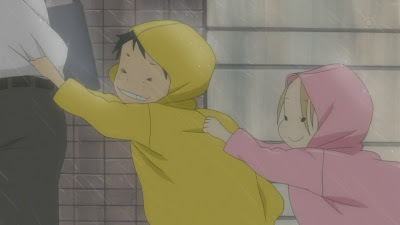 Rin's male teacher believed in a nurturing approach, complimenting the children on seemingly simplistic things (like Rin correctly using two colours for the different-coloured flowers instead of just one), while Kouki's female teacher ruled with an iron fist and berated Kouki on his various "incompetences". His wife runs the house, doesn't she. 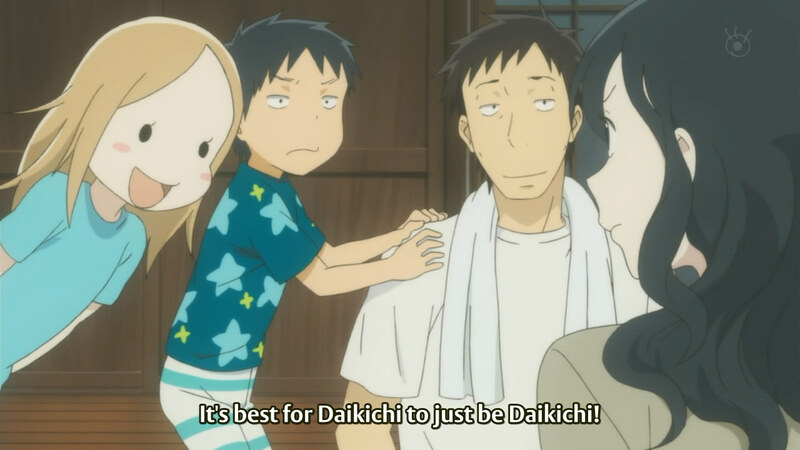 Meanwhile, Daikichi was found on his break, talking to his colleagues about their children. It turned out that Daikichi didn't have the various insurances his colleagues had - education, life, etc - and it made him think about what kinds of things to invest in. (It's always a good idea to be smart with money. I already had the impression that Daikichi didn't spend a lot, so there's a chance he just has money sitting in the bank.) He also internally thought about how happy the family men were, despite their various gripes in the conversation. The bigger you are, the harder it is? 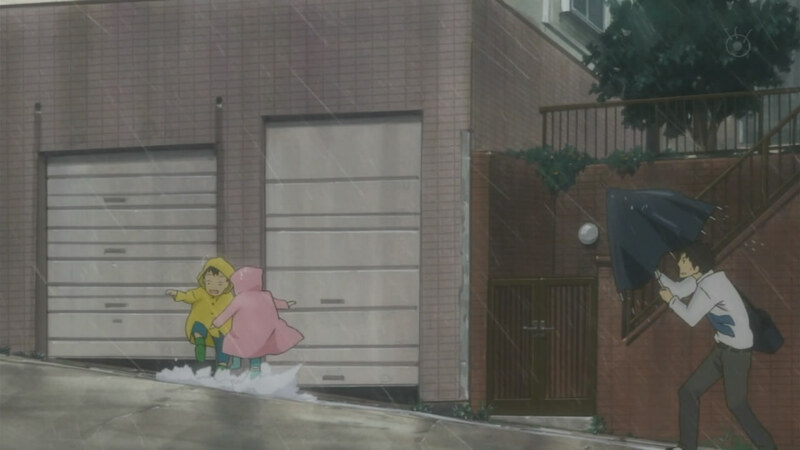 Once Daikichi got to the school to pick up Rin, he saw that Kouki's mother had yet to come. There was a brief moment of loneliness for Kouki, as he was being left behind, but both Rin and Daikichi offered (in synchronization) for him to go home with them. 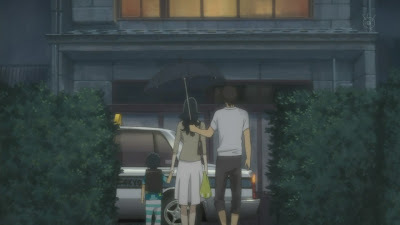 The remainder of the episode focused on the blended family, as Kouki's mother arrived at Daikichi's house some time later (on a rare day where she got off work early). It's interesting that Daikichi "demoted" into a labour job so he wouldn't have overtime, but Kouki's mother is unable to do so. I can understand; for many women, a labour job just isn't an option (that's what makes Daikichi's co-worker's case special). 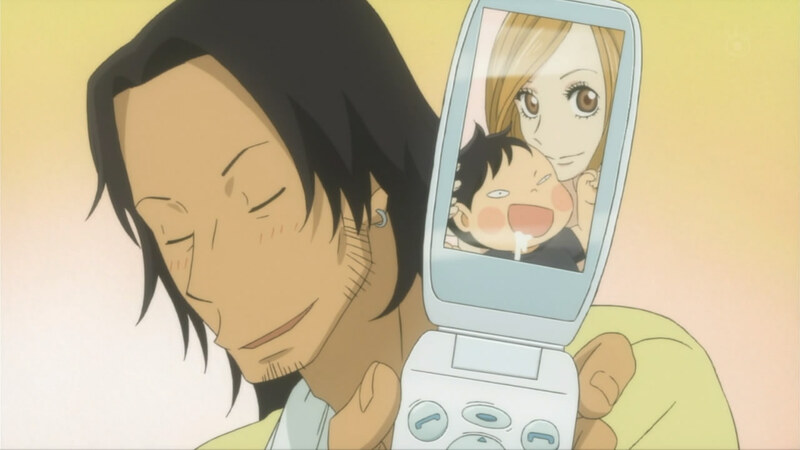 Once Kouki's mother arrived, the family really seemed complete. Daikichi had already helped both Rin and Kouki bathe, and so Kouki's mother (it would be nice if she was named) got to work preparing dinner. Rin helped almost the entire time, while Kouki's attempt was thwarted by the de-motivational power of onions. Even Daikichi felt the harmony in the larger family; as he sat with Kouki (who was making patties out of ground beef), he watched Rin and Kouki's mother getting along splendidly in the kitchen. It's really nice to see that not only does Kouki have a father-figure, but even Rin gets a female presence. I wonder how viable a coupling between Daikichi and Kouki's mother really is, once again. I'm always suspicious when these kinds of scenes are played. 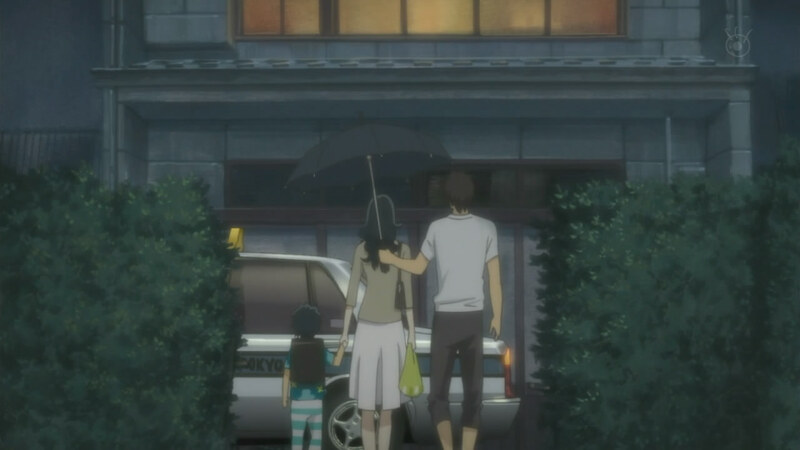 There was a lot of symbolism as Kouki's mother was leaving; she had the vibe of a single mother fighting hard, and then Daikichi showing up with the umbrella was just the icing on the cake. However, I worry that Kouki's mother is too busy for a relationship right now (despite it looking like a good idea), and so she's unable to see the potential. Moreover, Daikichi's just not forward enough to get the ball rolling, is he? What is wrong with that baby? With only two more episodes to go, it's looking like there might be a "big finale", but otherwise it'll remain a day-to-day story until that point. I can't hope for too much; at the most, I'd like to see some more relationship potential by the end of the season. Rin and Daikichi are getting along just fine; there's nothing specific I can think of that I'd like to see in the next two episodes.